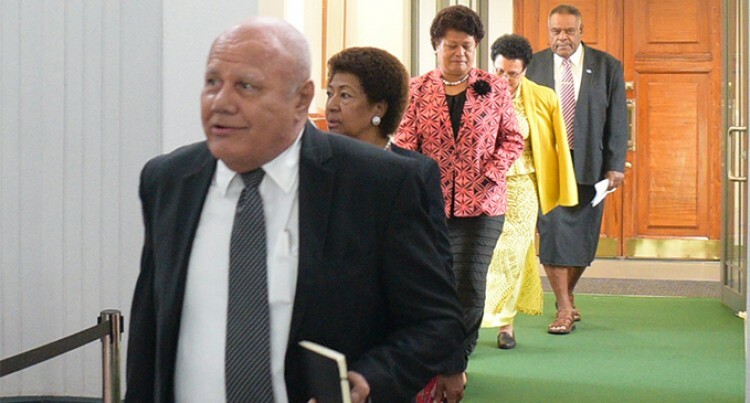 Opposition Members (from left) Viliame Gavoka, Leader Ro Teimumu Kepa, Salote Radrodro, Mere Samisoni and Mikaele Laewere as they walk-out during the session of Parliament on August 31,2018. Photo: Ronald Kumar. Fiji’s 2013 Constitution calls for Government and the Opposition to propose a presidential candidate for Parliament to vote upon when the presidency becomes vacant. The present President, Major General (ret’d) Jioji Konousi Konrote, was appointed for a 3-year term on 12 October 2015, and was eligible for reappointment. He was reappointed last week amid conflicting views on the legality of his nomination and reappointment. Naturally, the FijiFirst Government claims the reappointment was legal. The National Federation party did not disputed the legality and approved the reappointment, but complained that more than 48 hours notice should have been given of Government’s intention. SODELPA MPs did not propose a candidate and walked out of Parliament before President Konrote was nominated, an act PM Bainimarama called disrespectful. Their position — or, more accurately, their three or more positions — merit some attention because of what they tell us about SODELPA, and for their different premises. The first position is reflected in the close vote on walking out. According to the Fiji Sun, a significant number of MPs “opposed the walkout and wanted to nominate Ratu Ilisoni Vuidreketi. a former CEO of the South Pacific Tourism Organisation and a former Fiji Trade Commissioner to the USA and Canada , for President … but they were outvoted in caucus by a small majority.” Clearly, SODELPA is not talking with one voice. The second view was expressed by MP Semesa Karavaki, who stated that since the President is still serving. the position is clearly not vacant. The argument could have validity were it not for the fact that President Konrote was selected by Parliament to become the President one month before the former President Ratu Epeli Nailatikau’s term expired. And, with the Parliamentary recess due on October the 6th reconvening Parliament six days later solely for the reappointment would be ludicrous. The argument is tenuous but, significantly, Karavaki did not dispute the legality of the 2013 Constitution. Not so Co-Party leader Ro Teimumu Kepa. She believes that the appointment is illegal because the 2013 Constitution is illegal. For her, the 1997 Constitution (which was replaced by the 2013 Constitution) is “still the supreme law of Fiji and the Bose Levu Vakaturaga (Great Council of Chiefs, abolished in 2012) must have the right to choose the Head of State”. She said this while, curiously, accepting a parliamentary salary based on the “illegal” constitution! With co-leader Sitiveni Rabuka on a charge of incorrect “declaration of assets and liabilities” and the prospect of not being able to stand for Parliament — and with competition from the new Unity and Hope parties — it is now especially important for SODELPA to show more unity and much more realism that was evident over the President’s reappointment. If it does not, it is unlikely to increase or even maintain its present representation in Parliament after the looming election. Last week’s walkout could be followed by a walkabout, but unlike the Australian Aboriginal walkabout rite of passage that adolescents pass through towards manhood, SODELPA’s rite of passage could be terminal.